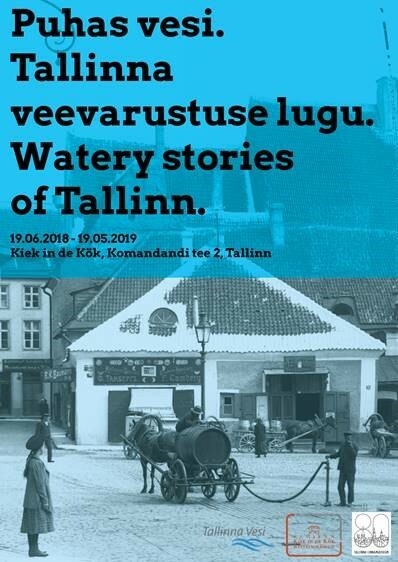 The exhibition “Watery stories of Tallinn” provides a thorough overview of how the town’s people were supplied with water and the history of water use through the centuries. In the exhibition you can follow the course of the Härjapea River and canal through the present day city and see the one-time location of water pipes and public wells. The water treatment unit shows how murky lake water becomes clean drinking water today. The exhibition is accompanied by an education programme and lecture series, which commences in autumn and introduces important topics connected to water purification and consumption. Clean water is a prerequisite of life. Settlements have always been established near a spring or river with clean water. In the early days of Tallinn the town’s people sourced their water from single wells dug on their own plot of land. Springs in the surrounding area were highly valued and water was delivered in barrel carts to the homes of the town’s people. Tallinn also had its own river – the little Härjapea, which supplied the inhabitants on the outskirts with water. Because of its steep descent many watermills were built on the upper and middle reaches. As a great achievement for its time a stone aqueduct was built from Lake Ülemiste to Harju gate in the 14th century. From there the water filled the moat on the southern and eastern side of the city, and even there it turned the wheels of many mills. In the early 15th century the city started to build wooden pipes, which directed the water from the millponds to the public wells located in the streets. It was not until the middle of the 19th century that the wooden pipes were replaced with modern cast iron pipes. To supply Toompea with water a new network of pipes was laid in the 1880s, with a pump house and water tower in Tõnismäe. Even in the early 20th century, water quality for the people of Tallinn was not something to get excited about. “Who hasn’t seen yellowish water flow from the taps, containing tiny fish, horsehair worms and other representatives of the animal kingdom,” wrote one newspaper at the time. In the mid 1920s, the city government ordered the first water treatment plant to be built. However, soon the original Lake Ülemiste could no longer supply the rapidly expanding city with enough water. In the 1920s, the water from Pirita River was directed to Lake Ülemiste, and in the Soviet period reservoirs were added and the lake was connected with Jägala River. The new suburbs of Mustamäe, Õismäe and Lasnamäe were built right from the start with a water supply.